Happy Life....: Where Were You Yesterday? Well I was glued on television for more than ten hours :-) Yeah from 5am until around midnight. I don't have any appointment or errand to do, so me and our DD just stayed at home all day. I opened the television in the bedroom while I was in our DD's room and when she woke up we transferred to the living room. The TV was on even if I was doing household chores because I don't want to miss out the historical event, the inauguration of the 44th President of the United States of America and the first African-American to become the President. 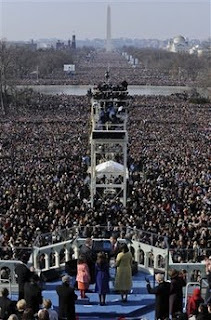 It is so amazing how the national mall was filled with millions of people. I am just watching on TV and I can feel the excitement as well seeing the sea of humanity. I myself is also inspired by the President's call for hope and unity. The value of taking the responsibility and be accountable of our own action is old and we need to uphold it to achieve the happiness and success that we all crave. 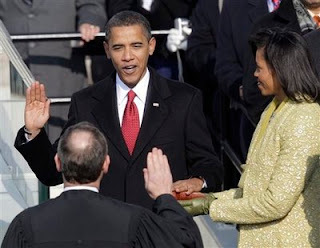 President Obama's inaugural speech is very moving and even though there are those political historians and media who have been critical with it, but for me it sent out the message that inspires a lot of people. More Power to the new President and I pray for the unity of all Americans to get through this hard times.